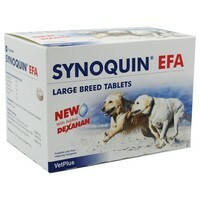 Synoquin EFA Joint Supplement Large Breed is a nutritious supplement that encourages the growth and maintenance of cartilage and healthy joint formation. Key ingredients, such as the naturally occurring Chondroitin and Glucosamine, provide support to the repair and maintenance of joints, allowing dogs to keep active and improve overal health. Suitable for dogs weighing over 25kg.